This article was written for issue 1.10 of the Glitchet webzine. Thanks to Way (@wayspurrchen) for editing. Edit (Feb 1st, 2017): I originally had some misleading wording regarding who first made Random Art. It was created by Andrej Bauer, not Adrian Perrig & Dawn Song. Those last two people introduced it as a security measure in paper. There has always been a question if a computer can art. Sure, computers have been vital to the creative industries even before the boom of the 1980's. But what about a man made algorithm? A set of organized logic creating imaginative works. A process from the left brain making a product of the right. We call it procedurally generated art. I don't want to get into things like Deep Dream or WolframTones as those are more artificial intelligence projects, but none the less still fascinating creative computing projects. Now, don't those look completely distinct? Say if someone had to manually input a crypto key (the poor soul), this can be used to easily tell if it was punched in correctly or not. Random Art was originally developed by Andrej Bauer, but it's application for security purposes was introduced by Adrian Perrig & Dawn Song in this paper. But in a nutshell here is what is it: that string of characters that we gave are used to seed a (pseudo) random number generator. Then from there it generates a series of equations (in the form of a grammar for us Comp. Sci. people). 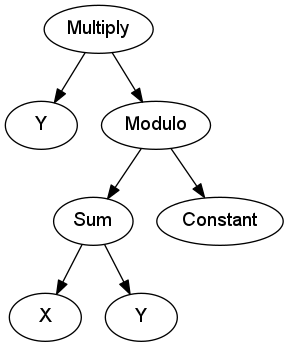 Over a coordinate system, the equation tree is run through. It can either barf out chunks of ASCII text or puke out a rainbow of pixels; all depending on how you want it rendered. Still don't understand? Let's build up the parts from the ground up. If you want to play around with Random Art, I'd recommend grabbing a copy of my Nim implementation (GitHub mirror). 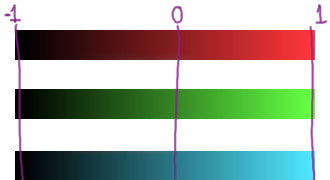 Colours are represented as a decimal that ranges from [-1, 1], which then upon rendering is mapped to the range of [0, 255]. Right now that really isn't colour; it's a greyscale value. To, well, add colour we take three of these. Shoving them into a triplet, assigning them each a primary colour of red, green, and blue. 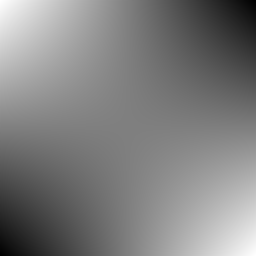 If a value goes beyond that [-1, 1] range, it will be clamped to it (e.g. -1.5 will become -1, whereas 2.5 becomes 1). In my Nim implementation, I added a fourth channel (that first "1") which represents an alpha value. It doesn't do much right now though. Just bear with it right now. Lovely isn't it? No. It's pretty boring. The fun happens when we start to involve some actual math. Random Art goes over a coordinate system. 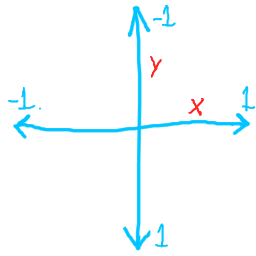 Typically this is your XY Cartesian plane, though the Y axis has been flipped along the horizontal. Both axes are usually bound between [-1, 1]. Let's backup to greyscale for a little bit to keep things easy. What's the first math operation we all learned to do? Add. If you're wondering what that mod keyword is, that stands for a Modulo operation. This is specifically using the one that is found in Python. It can generate some pretty cool looking effects. Expression – This is something like (sum ...), (var x), etc. Terminal – This is an expression that can't have any child expressions. These are things like (var y),(const ...), etc. Non-Terminal – This is an expression that needs to have children. (mul ...), (sin ...), etc. Generating random numbers is its own topic which I don't want to get into. I'll leave this link here as a place to start. And... that's all there really is. You could always use some other method that generates the tree. Make it right dominant, left dominant, add new types of expressions (random-art.org has a lot more expressions in it), etc. It's all up to what you want to do. I used the song "一人で [Power]" by " チェスマスター[chess master]", thanks to Dream Catalouge for letting me. This was made using a distributed C# rendering framework (for Random Art) that I wrote; as rendering each frame on a single computer would take a long, very long, time. I added an extra t variable to the list of possible expressions and then had it render over a range (e.g. [-1, 1]). My little "artists," running on a cloud service would then upload their renders to a central source. I would then download those images and compile them into clips using FFmpeg. From there I would cut up and edit the strips together in Blender. Added music and then voilà, I had a film.